Get ready to have some fun in a blissfully climate-controlled setting. We’ll be continually updating this list, so let us know about your favorites. Important note: Some pay-to-play centers may not be open on weekends because they host parties, so be sure to check on hours in advance. This Plano attraction abounds with bounce houses of all shapes and sizes including giant versions of a gorilla, alligator and octopus. Kids can also enjoy unlimited train rides during open play. All day admission is $5 for children under 3 and $8 for children 4 and older. coocoos.com. This weekday playspace in Frisco features a ball pit, dress-up fun, a dancefloor, toys and books. $10 per child; $2 off on Tuesdays. Free for parents or other caregivers. thecoopfrisco.com. The Crayola Experience opened in March 2018 at the Shops at Willow Bend and features 22 hands-on creative activities.One of only four exhibits nationally, the Crayola Experience in Plano involves a multitude of artsy activities along with a two-story crayon-inspired Color Playground. Another section of the experience, the Stomp & Play area, features a giant air hockey table projected onto the floor. Read about more ways kids can go cray-cray at this popular spot. Tickets are $20.99 at the door or discounted $2 online. crayolaexperience.com/plano. This Frisco cafe lives up to its name, as kids can play on a paddled jungle structure while parents sip a cup of joe. The cafe also includes iPads with games for kids to enjoy. Admission is $5 for ages 1 and under, $8 for 2-year-olds and $10 for ages 3 and older. junglejoesfrisco.com. This Plano attraction features a two-story playground maze, bungee walls, zip-lines and more. Free for infants; $3.49 ages 1-2; $6.99 ages 3-18; $1 for those 19 and older. kidmania.com. With an emphasis on STEAM (which stands for Science, Technology, Engineering, Art and Mathematics), this play place centers around rotating exhibits that promote problem solving. Prices are $13 for the first child and $11 for each additional child. littlehumansbigfun.com. Obstacles are the main attraction at this kids’ gym, which has locations in Dallas (near Farmers Branch), Garland and McKinney. Youngsters 2 and up can climb, jump and challenge their sense of balance during open play. 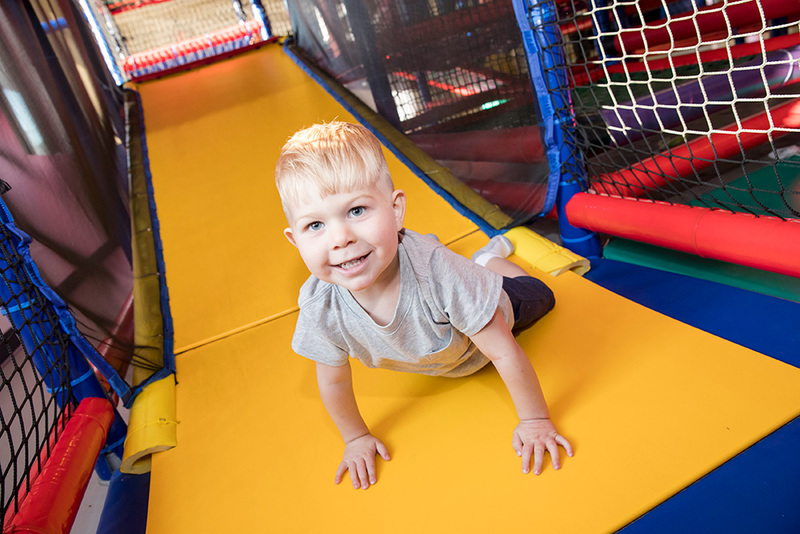 $8 or $14 for one or two hours of open play, respectively, for kids ages 2 to 4. $10 or $18 for one or two hours of open play, respectively, for kids ages 5 and up. “X-treme zone” access costs an extra $3. obstaclewarriorkids.com. A skyline-themed play structure is part of the fun at the Perot Museum of Nature & Science. Admission to this fabulous downtown Dallas museum includes the Moody Family Children’s Museum, geared toward ages 5 and younger. There’s a mini playground version of the Dallas skyline, water tables and a play farmers market. An art lab with manipulative exploration offers kinetic learning for little ones. General admission is $13 ages 2-12, $20 for 13-64, $14 for seniors. perotmuseum.org. In a set of tiny buildings where imagination takes center stage, children are able to play in a plush garden, retro workshop or plastic bakery. Open play costs $10.50 ages 1 and up, $8.50 for siblings of the same age range, and children under 1 are $5.50 or free with a sibling. playdateco.com. The Play Street Museum indoor play center has three locations where accompanying adults can play along or just relax. In McKinney there’s a farm theme (a cow and a giant Lite Brite are among the highlights). In Plano, it features an Adirondack-inspired village and campsite with adorable mini versions of a fishing pier, a general store, a camper and more. The original Play Street in Frisco features a teeny town with attractions including a shop, a restaurant and a doctor’s office. Play Street Museum also has locations in Allen, Lake Highlands and Irving, and each has a different theme. The company expects to open new Play Streets in Keller, Prosper, Richardson and Flower Mound. $11.50 per child ages 1 to 8. playstreetmuseum.com. Climb on a multi-level play structure, check out the arcade and do some sliding at this Plano play center, which is geared toward ages 1 to 10. $11 for children; adults are free. safarirun.com/location/plano. 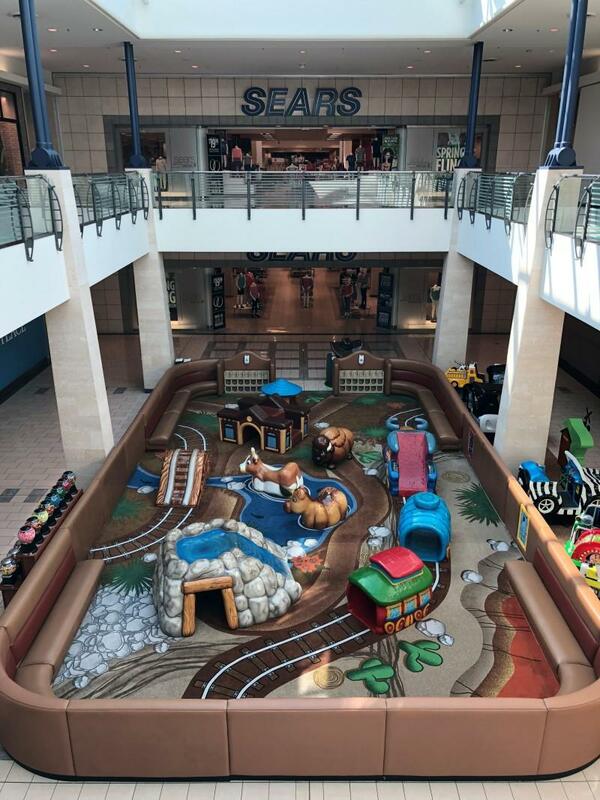 The play area on the Plano mall’s lower level has lots of soft-surface structures with an outdoor theme for climbing fun. collincreekmall.com. Free general DMA admission is already a good deal, but access to the Center for Creative Connections is an added perk. In addition to an interactive gallery and a spot for art projects, there are two spaces for youngsters. Arturo’s Nest is an oasis for kids 4 and younger with toys, puzzles, books and a big nest for the museum’s children’s mascot Arturo. The Young Learners Gallery for ages 5 to 8 includes activities, artworks and spots for reading. dma.org. Climb on structures in a rainforest-themed play area on level 3 of the Dallas mall. (The mall’s ice skating rink is another cool option for fun on a hot day.) galleriadallas.com. Known as The Tubes and The Bugs, these indoor playgrounds inside the Irving church feature a maze of plastic tubes with heights of 52 and 36 inches, respectively, where children in fifth grade and under are free to roam. Open 7 days a week. irvingbible.org/buildinginfo. Soft play pieces with a Plano theme, including mascots from area high schools, are featured on this mall’s lower level. There’s also a scavenger hunt and an interactive game wall designed to look like a hospital. shopwillowbend.com. A variety of this church’s facilities are open to the public. Watermark Treefort, constructed to resemble a real outdoor fort, provides a unique indoor playground experience. Tiny tots can play on the lower level while older kids climb to the top and scale rope bridges. watermark.org/dallas/treefort.